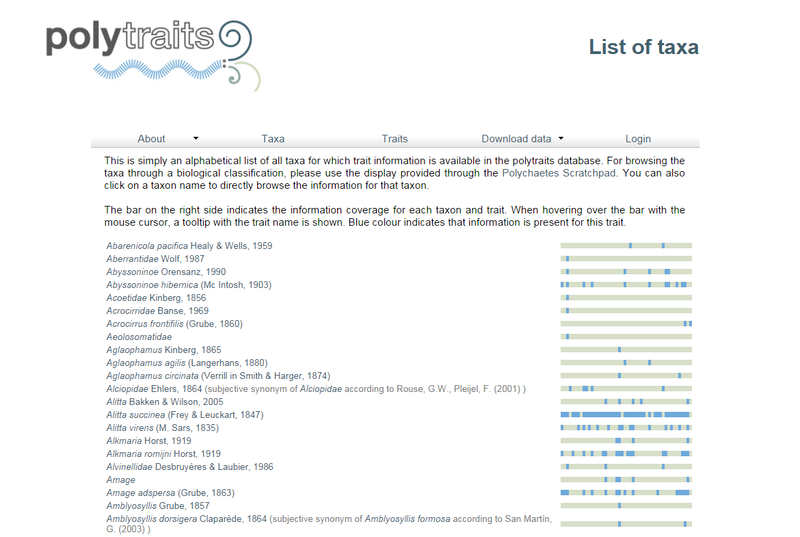 Polytraits is a database on biological traits of bristle worms (Polychaeta). The database contains 47 different traits describing the morphological, behavioural, reproductive and larval features as well as the environmental affinities of a taxon. Each trait has several sub-categories, so-called modalities. In total, 252 modalities are covered. The expression of a trait in a taxon is coded in the database by declaring each modality as present or absent. Each assignment of a modality (and its presence/absence value) to a taxon is connected to a literature reference. This assignment is mandatory, no data can be entered without specifying the source of the data; however, to capture undocumented knowledge, the option "Expert's opinion" can be specified. Additionally, most records are accompanied by the quotation of the exact literature passage which has led to the coding of the information. The project was initially started as an in-house project of the Institute of Marine Biology, Biotechnology and Aquaculture of the Hellenic Centre for Marine Research. Traits were initially collected for an ecological analysis of polychaetes in Mediterranean lagoons, but since then the database has been continuously expanded to provide data for other analyses as well. Currently, Polytraits is being maintained by the Institute for Marine Biology, Biotechnology and Aquaculture of the Hellenic Centre for Marine Research and is supported by the Greek LifeWatch infrastructure.